This photo shows the injected wax model made from the rubber mold, sprued and ready for casting of the sterling replica cross Bishop-Elect Doyle has requested. I inject pressurized molten wax into the rubber mold void to get a molded wax model I can work with for additional projects that may stem from the original design. 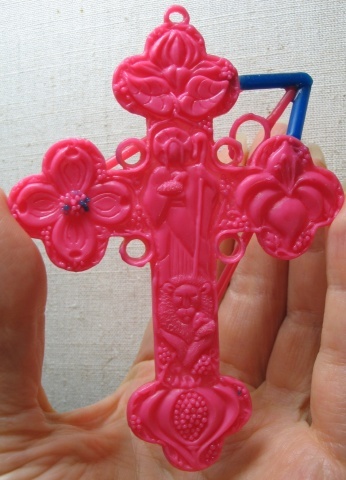 We have discussed making smaller quatrefoil crosses with the botanical symbols from the ends of his cross, that will be made available for purchase in the future. The wax injection rarely reproduces all the fine details of a complex design like this so more wax work was required to add and refine some of the details. Some of the touchups are visible where I used blue wax.